Best Betta Tank 2019 - Buyer's Guide & How To Set It Up? Home » Fish & Aquariums » Best Betta Tank 2019 – Buyer’s Guide & How To Set It Up? Best Betta Tank 2019 – Buyer’s Guide & How To Set It Up? Of all the best betta tank aquariums I tested, there are some that stand out from the crowd. Recommending good fish tanks to people who’ve never had one before takes times. There are many factors to consider and features to look forward to. Knowing why you need a betta tank is thousands of times better than buying right off the hook. That’s why you need this betta tank buying guide to know what to get quickly. Having said that, I have hand-picked some of my favorite choices to the point of total obsession. They’re spacious, productive, and very durable. The reason why betta fish tanks are unique is that betta fish like to be kept alone. They do not communicate well with other fish roommates when kept in the same fish tank. That’s why it’s important to keep a separate fish tank for your betta fish. Setting Up a Betta Tank - Can You do It? What Goes in a Betta Tank? Choosing a betta tank on the market today will expose you to the world of hundreds of different tanks or aquariums. Some seem well-fitted while the others not so much. The catch here is to find something that works for you and keeps your betta fish happy and comfortable. You’d be surprised to know that there are some very modern and efficient tanks on the market to that effect. I’ll quit the hemming and hawing now. Let’s talk about these best betta tanks I love so much! The Tetra 29095 Cube Aquarium Kit is for the new kid on the block. It fits well everywhere from the kitchen to classrooms to a library. Wherever you want this seamless cube aquarium, there it goes. What's so great about this best betta tank is the 3-gallons capacity. If you know betta fish, you know why a large water capacity is essential. If you've always used a small bowl or vase for your betta tank, overlooking this one would be a big mistake. It has everything your betta fish needs not just to survive, but also thrive. And since betta fish love diversity, you can create a different sense of space in this cube tank. The transparent as glass screen comes in acrylic. The cube design and durable build boast of a smaller footprint. That means it takes up tiny storage space in spite of offering a large water capacity. Being 10-inches in measurement on sides and 10.5-inches tall, this betta tank is well-made. The point here is to make this betta tank heavy with water, gravel, and other decorative items. Only after this stage does the betta tank weigh around 30-pounds or so. Moving forward, the plastic/acrylic tank resists shattering and cracking. But it would be better to keep it away from pets in case they get very curious and playful. Taking care of a betta tank doesn't take much effort unless you set it up incorrectly. Anything as delicate as a betta tank is likely to damage. So you have to keep your eyes open all the time to make sure no harm comes to your betta fish and tank. Another impressive feature of this betta tank is the LED light. This means you can set eyes on your betta fish swimming around after dark. The feeding hole, power filter, and bio-bag small cartridge are some of its best features. Did you know betta fish are expert at jumping? Especially if you have more than one betta fish in the tank. So a durable top cover seems important, right? This betta tank offers a solid top lid with a secure filtration system. The water pump also comes with a safe plastic screen at the bottom, so your fish won't plan an escape from there. I know this sounds crazy! Which fish would even try to risk escaping from the water pump? But it has happened before! That's why being careful is not an option, it's a matter of life or death with a betta fish. The downside to this betta tank is that it’s molded plastic which means it’s susceptible to scratches and dents. So you do have to be very careful not to mishandle it. The EcoQube Aquarium Desktop Betta Fish Tank is a small, but efficient betta tank to choose. It works exactly like other high-grade betta tanks for perfect landscaping. You can store it anywhere you like including in tight spaces. Thanks to its 2-gallons capacity, this best betta tank holds betta fish comfortably. Having said that, the aquaponics filter takes most of the effort out of your hands. That's because you won't have to buy a separate filter for each betta tank. The decorative items include a mountain stone and sand decoration. All you need to do is add the gravel. For some extra sprucing up, the basil seeds of this kit add color to the whole landscape. This way your betta tank doesn't look very artificial and your betta fish are more than happy. If you thought that's all the basil plant seeds can do, think again. Science proves that the bigger a basil plant gets, the stronger it cleans. Live plants in a water tank act as an active filtration system to keep the tank clean. The plant-based filter makes all the difference if you ask me! Next, I'd like to talk about its LED light. It even comes with a remote control for its varied LED light settings. It also helps accelerate the growth of the basil plants. All the elements in this betta tank help keep it neat and clean. I loved the plant-based filtration and am looking forward to the kind of influence it will have on the water. With such kind of "natural" technology, your betta fish will feel less smothered. It elevates the tank’s environment making it easier for your betta fish to adapt. Since betta fish have a tendency to cause harm to themselves by jumping, it takes a whole lot to make them feel cozy. The only downside to this betta tank is a small size. If you loved this tank for what it is, there's a possibility you would have preferred it in a much bigger size. The Back To The Roots Water Garden is a very productive and valuable betta tank. It maintains a healthy ecosystem between taking care of your fish and growing herbs. If you've ever heard of water gardening, this is the closest example for it. With this best betta tank, you can create a healthy and natural environment for your betta fish. You can grow different herbs and plants that help nourish and clean the water in the tank. How these betta tanks works is the betta fish fertilizes the plants that grow above. The plants act as a potent agent to filter all the waste particles from the water below. Plus, fish excrete toxic ammonia that needs to be cleaned right away as it causes harm to the fish. And it's commonly known that plants vegetate much faster with the help of ammonia. Hence, the plants absorb it and grow twice as fast as other traditional methods. This betta tank comes with plants seeds that expand very fast in a matter of days. And the water stays much cleaner than any other non-filtered fish tank I've seen before. And thanks to the water-gardening, keeping it clean and betta fish-friendly is easy. The fish tank has a water capacity of 3 gallons, and it features a submersible water pump and gravels. The science behind the Back to the Roots Water Garden offers a superb ecosystem. Everything you'd want from a fish tank, this betta tank surpasses all expectations. Between the water garden and aquarium, there's nothing more you could ask for. I always liked to grow different kinds of herbs and plants in my kitchen. The amount of sunlight flooding in during daytime works incredibly well to grow all sorts of herbs I could use for cooking. But with this best betta tank, I couldn’t possibly ask for more! The herbs that didn’t usually grow in my kitchen, sprouted up faster because of the water ecosystem. And by the looks of it, my betta fish and water garden look happy and very comfortable. The only downside to this betta tank is that it lacks a water heater. Betta fish do not adapt to all kinds of temperatures, that is why having a water heater is crucial. The Fluval Spec III Aquarium Kit is a 2.6-gallon fish tank suitable for small spaces. You can keep it on desks, countertops, or near the window. But it must be on something sturdy and unbreakable. This tank is comparatively lightweight and compact than others. It features an etched glass screen with clean edges. Weighing only 10 pounds, some might think this tank is not fit for betta fish. But to tell you the truth, it's anything but. Many people would love to buy a small fish tank with an expert lighting system and durability. About placing decorative items and plants in this tank, there's more than enough space to do so. There's plenty of water circulation, thanks to the adjustable pump and filter. There's no filter mount as it's a part of the foundation of the betta tank itself. So no space-consuming hang-on filter. It, all-in-all, a compact and lightweight betta tank made with only durable components. The filter system boasts of 3 stages which result in clean and ammonia-free water. Other features that help enhance the filter system are the BioMax bio rings and handle. They provide enough filtration for a small betta tank - the kind that will last you a very long time. The LED lights are plenty, but not too bright. So when you turn it on, it won't bother your betta fish at all. In case you want to keep the light aside during day time, you can do so as the light, and top covers are very easy to detach. The shelf life of the light run for as long as six months, so you might have to change them afterward. Harvesting the "good" bacteria for perfect landscaping is essential for betta fish. A drastic change in environment may frighten the fish causing even more distress. If you want to avoid that, but naturally, this betta tank might help. It features bio rings that stock up on beneficial bacteria to keep the tank clean and natural. It's a major plus point because, without it, your betta fish might die because of an "unnatural" habitat. The only downside to this betta tank is that it is too small, to begin with. It only makes a good beginner kit for people who’ve never used a professional betta tank before. The API Aquaview 360 Aquarium Kit takes the prize for its eye-catching design. It is a straightforward and inexpensive betta tank with lots to offer. It's super large in capacity (6 gallons) and is a perfect match for bedrooms, living rooms, and offices. Big fish tanks need more maintenance, to begin with. But this comes with its starter kit to make things easy. The internal water filter, LED lights, and 360-degree view makes all the difference. Because of its significant size, you can add as many plants, caves, and tunnels as you like. Betta fish love to hide behind stones and rocks, so this will make your betta fish even happy. And there's plenty of room left for your betta fish to swim around freely. Plus with the 360-degree screen, you can observe your fish from wherever you want. It's that simple! Moving forward, I'd like to speak a few words about the customizable LED lights. It's not just white light, mind you - you get colors like amber, red, purple, green, blue, and aqua. These LED lighting effects are accurate and reliable to hold on to. Also, it comes with an energy-efficient tag which means it doesn't warm up the tank or take up most of the energy from it. The LED lights last longer without the aquarium heat transference people always hate. If you want, you add other fish to the tank (not another betta!) since it's a large fish tank. These can keep your betta fish entertained along with some fun toys you add in there. I was thinking how diverse it would be to keep a few ghost shrimps and add toys in the tank. They’d excite your betta fish while she roams around freely in the tank. Keeping two betta fish in the tank is a strict no-no, but you can always keep colorful playmates for your betta fish, right? The water filter system and LED lights are perfect for all types of fish. Plus, you make the most of the 6-gallon capacity. The only downside to this betta tank is the inaccurate LED lights. It may be so that the LED lights stop working after a few weeks or from time to time. This happens because the water enters the LED lights causing an unrepairable leak. The Tetra LED Half Moon Betta Aquarium is a great buy for someone looking for a cordless betta tank. It is a 1.1-gallon tank and comes in a variety of packs of 1, 2, 3, 4, and 5. So if you have more than one betta waiting for you, you can separate each of them in these tanks. This best betta tank has a copious habitat for a betta fish to thrive. The LED light and firm handle make all the difference. It runs on three power batteries, or you can even charge it with the help of a USB cable. Even though it packs a small punch, this betta aquarium comes with a feeding hole. So you won't have to lift the lid completely to be able to feed your betta fish. If you think that's a bit too much, you should know why this feature is so important in a tiny betta tank. Betta fish, when kept in smaller tanks, have a tendency to jump out of the tank. Sounds like a total suicide attempt, if you ask me. But with the right gravel, clean water, and plants you can create a more natural environment for your fish. Plus, the secure top lid with a feeding hole makes things less tricky to deal with. For small rooms, this cordless betta tank will fit in well. The white LED lights fit outside of the tank. And that means the water has no reach to damage the lights in any way. And the compact design makes it easy to clean and maintain for months. 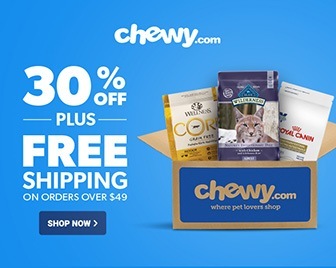 Did you buy twobetta fish at the pet store? Don’t fall for the small plastic bowls that look dull and are kind of inadequate for a betta fish. As an animal lover, you want your pet fish to roam around happy and free. Not stuck in a small bowl until the end of her days. Not giving her the comfort of a lifetime is selfish and mean, if you ask me. As soon as you keep your betta fish in this tank, you’ll notice an instant change in behavior. Your betta fish will swim through tunnels and hide behind rocks like there’s no tomorrow. Your betta fish will make this tank her home, without needing plenty of room. The only downside to this betta tank is that it doesn’t come with a filter or heater. This is a major disappointment because of the added expense. The Fluval Spec V boasts an ergonomic design with neatly trimmed edges. It's big on features like the 37 LED lighting system and 3-stage filtration system. What's so beautiful about this best betta tank is the great cleaning habitat. It's for those who love big tanks with the peace of ammonia-free water. Instead of looking for solutions to clean unfiltered water in a tiny tank, why don't you upgrade? The surface of the tank is smooth so avoid accidental injuries. The filter offers a mild circulation so your betta fish can swim, play, and sleep comfortably. The best part about the filter system is the suction through the filters. This consistent circulation allows your betta fish to sleep without having to swim. It's in a way allowing your betta fish not to keep moving his fin while sleeping. The design is such that you can maintain the filter and heater away from sight. You might like this feature, as most people do, as the built-in filter compartment is not all that attractive. Most betta tanks allow you to fit in the filter and heater outside the tank, blocking some of your views. But this tank is an exception. It even features a blue night-time mode with plastic LED lights on the lid for easy feeding. So far everything looks and works great! Betta fish are adaptable, but not in extreme temperatures. If you keep them at room temperature, they'll live a healthy life. But if you live in conditioned environments, it has a major effect on the fish bowl. Coming home to a betta fish that's always lethargic and inactive is not a good sign. It can mean two things - a bored betta fish or incorrect water temperature for survival. And if it’s both, even worse! So it's probably best if you transfer your betta fish to this best betta tank. The only downside to this betta tank is that you need a submersible water heater to maintain proper temperatures. But this tank doesn’t come with one. So the added expense of buying a separate water heater to go with this tank’s filter system might feel a bit inconvenient. The Tetra 1.8 Gallon Waterfall Globe Aquarium Kit is the perfect countertop aquarium. It features a small 1.8 gallon capacity with a globe-like design for a better view. This best betta tank is a very comforting companion while you work, study, or write. Look up from your desk, and you see your betta fish swimming happily around the plants and rocks. Not to mention, it features a waterfall-like water circulatory system. This not only looks good but also adds purpose to the whole betta tank. It produces more oxygen, reduces dirty accumulation, and creates a mild current. This keeps your betta fish happy and healthy for all lifetime. The technical details are not so hard to grasp. Especially the pump drive power filter. This system has only one responsibility, and that is to keep the "good" bacteria in and the "bad" bacteria out. The LED lights have a separate power button for efficiency. It's enough to illuminate the tank in the dark and create a natural environment for your betta fish. All you have to do is add 2-3 plants and maybe a tunnel in the middle, and that's all! The filtration system is cartridge-based, so it's more efficient and consistent. The wiring is perfectly safe and rugged, so you won't have to spend the time to set it up. This betta tank is a beautifully quiet aquarium for your betta fish. The waterfall feature is more inviting. While the constant water cycling oxygenates and cleans the water for better health. Another interesting feature that you will adore is the glass globe magnifying screen. It gives you an up close and personal view of your happy betta fish. The only downside to this betta tank is in the quality of the aquarium. The hinge of the top lid feels delicate, and the glass bowl lacks ruggedness. This means it’s prone to scratches so proper care is essential. The Fluval Edge Aquarium is a beautiful betta tank with feature-extensive usability. It has an incredible design, convenient compartments, and plenty of space of ornaments. If mean you can keep more as many plants as you want with a few rocks, maybe a tunnel, and gravel. And you will still have plenty of space for your betta fish. It's amazing how modern and sleek this betta tank looks. It comes in different colors, offers 360-degree viewing, and has a hidden filter system. The hidden filtration system provides a 3-stage process for healthy and clean water. It preserves the "good" biological bacteria while destroying the rest. Plus, it's so well-hidden and built, you won't believe your eyes when you see it. The contemporary wrap-around design holds the tank and keeps the filter out of sight. The durable top lid keeps moisture, dust, and heat out of the way. If you're worried about the small opening, that is the only access to the inside of the tank. You will be glad to know that it comes with cleaning tools to make matters simple. The media trays, versatile design, and intuitive LED lighting make all the difference. 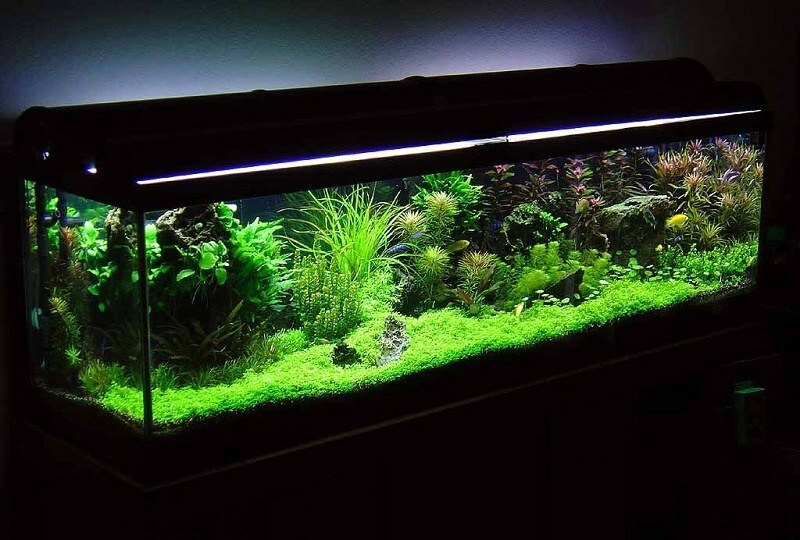 Whatever you keep this tank on, it looks tidy and resembles a piece of art! Nothing beats the expert lighting system and hidden filter design. Especially good for people who know their way around setting up a betta tank. To get that natural look, you can flood this tank with lots of beautiful plants and top it off with a tunnel in the middle. So when you turn on the LED lights, the light will bounce off the plants to create a soft, but earthy appearance. Perfect for a betta fish, don’t you think? The only downside to this betta tank is the complex assembly. It’s not like a standard fish tank. You will have to set up the filtration system and attach the LED lights. But the cleaning tools this tank comes with make the process a bit simpler. The last pick on the list is the MarineLand ML90609 Portrait Aquarium Kit. It's a 5-gallon fish tank with plenty of room for plants, ornaments, and of course your betta fish! It is backed by an active 3-stage process that self-cleans the water. So you don't have to clean it for at least a whole month. Its expert filtration system boasts an adjustable flow filter pump. 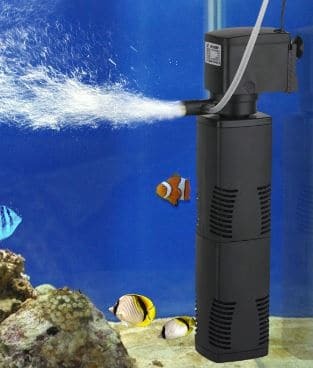 This pump promotes good circulation inside the tank. I love the contoured glass corners and black stand which makes the tank easy to clean from all corners. This ergonomic design has a sturdy base and well-rounded edges to avoid slipping. Unlike most aquariums, this best betta tank comes in an extended portrait structure. Leaving plenty of room for great plants that usually don't fit in other tanks. Moving forward, I'd like to say a few words about this tank's filter system. It's relatively quiet and requires cartridges to operate consistently. Rest assured, filter cartridges are available in your local pet shop. So the added expensive is hardly even noticeable. The last feature on the list is the top cover. It flips securely off and on the top. It stays tight enough to restrict any water getting to the cord. With that out of the way, all the components on this betta tank are efficient and durable to use. It doesn't need any repairs or replacements as long as you don't mishandle it. After all, it is a delicate equipment supporting fragile life. So being careful is not a choice. The aesthetics of this betta tank are impressive. It has a tiny footprint, is sturdy, and has a seamless design. For a small space, you can fit in this tank easily without worrying much about the design. It does have a significant capacity but holds little ground from the outside. The only downside to this betta tank is the dazzling LED lights. You may have to modify the settings, so don’t injure your betta fish’s eyesight. Betta fish are able to survive varied environments. So keeping them in decorative tanks with plants and other fish-friendly items is a must. With that out of the way, setting up a betta tank doesn’t take much time unless you don’t know what to get. That’s why I’m here to help you, right? Picking a large tank for your betta tank is the most important step to take. Keep your betta fish in any plastic and glass bowl is a complete waste of money and effort. You want your fish to thrive instead of existing in that tiny space. Another pointer to keep in mind when buying betta fish is to house them separately since two betta males or females fight each other if kept in the same tank. Setting up the filtration process is very efficient. Betta fish are adaptable to streams with a gentle, but consistent current. Anything above or beyond is not suitable for survival. A filter with adjustable current settings is ideal for a betta tank. Based on the size and capacity of the betta tank, can you buy a gentle and accurate filtration system? Even though betta fish able to survive in unfiltered water, the reason to use a filtration system is to produce a mild current. Without it, in the betta tank, the fish may die very quick. Because betta fish eat a lot and hence cause more excretion, regular cleaning of the tank is a must. Next step would be setting up the water temperature. Betta fish are adaptable to temperatures between 74 and 85 degrees (Fahrenheit). You can buy a handy water heater with a thermostat to keep monitoring the temperature of the tank. Laying down gravel is the first thing you need to fill the tank with. It’s responsible for the proliferation of healthy bacteria which helps decompose waste. Choosing smaller gravel pieces than large rocks is essential. Because with large rocks, the waste particles can easily get lodged in-between the gravels. Also, choose nature-colored gravels that don’t create a less artificial environment for your betta fish. Incorporating natural plants that help keep the water healthy for your betta tank is a must. I’ve mentioned this once before, but I’ll say it here again that betta fish are not like other fish you buy for your home. They can thrive in varied environments. So buying freshwater plants for your betta tank is probably a good idea. 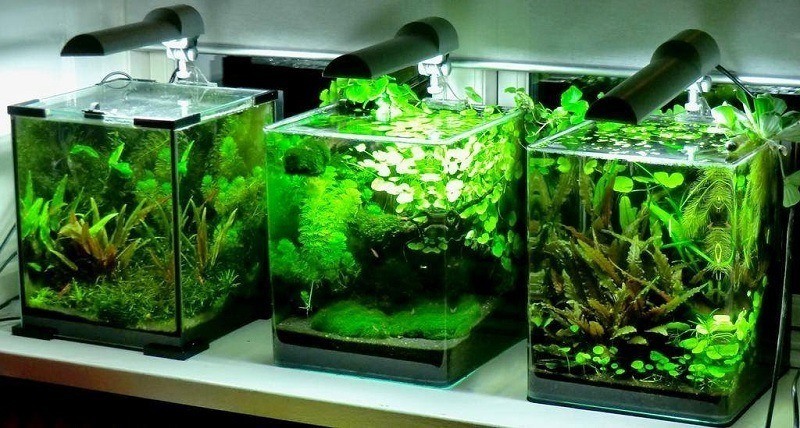 Plants filter out toxins from the water, offer oxygen, and help fish breathe more freely. Another essential addition to your betta tank can be decorative ornaments. Including tunnels, caves, bowls, etc. Betta fish like to hide in corners, swim through tunnels and sleep on bowls. But nothing too sharp or crowded otherwise it could harm your fish’s life. If you do not find something relevant, you can use sandpaper to cover sharp edges or uneven surfaces. 1. Pick the most comfortable spot in your room, living room, kitchen, or study to set up the tank. It’s best to keep it close to a window, but slightly away from sunlight. And if you have other pets at home, maintaining the tank at a height on a solid surface is a must. 2. Keep the tank a few inches away from the wall. The space between will accommodate the filter and water heater. 3. To install the water filter, set it up at the back of the tank. Most betta tanks come with a factory cut-out to fit the filter in. This will take only a few minutes install. 4. 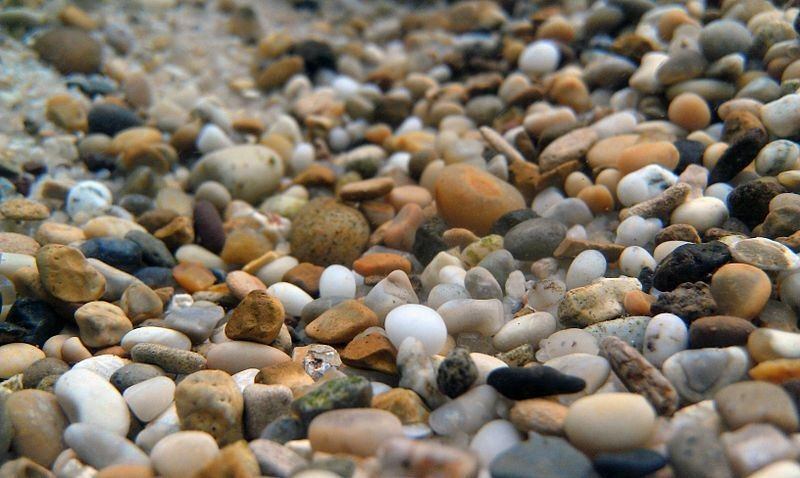 Rinse the gravel rocks in fresh water without the use of soap. This will remove all dust particles stuck in the gravel. Using a scooper, slope small gravel portions on the bottom. Starting from the edges, cover at least 3 inches of gravel. 5. Place a large plate on top of the gravel and fill the tank with water until it is 1/3 filled with water. Slide the plate from under the water gently to prevent any displacement. 6. If you’re adding plants to the tank, ensure that the roots reach inside the gravel. Arrange the plants in a way that it looks natural and real. After adding the plants, you can place other decorative structures like a tunnel, cave, etc. close to the edges. Make sure to leave lots of space for the battered fish to swim around. 7. After that, fill the tank completely and turn on the filter. This will produce a mild circulating motion in the water. Adjust the settings for a gentle current, nothing too compelling. 8. Attach the water heater inside the tank. Keep it near the mouth of the water filter. This will enable proper heating and circulation. 9. Pour neutralizer into the tank to remove all chlorine particles from it. Tap water contains massive amounts of chlorine. But if you use distilled water, you are not required to add neutralizer to the water. 10. A fishless cycle is the last step you need to take before you add your betta fish in the tank. Without this step, there is a possibility of your fish dying due to the drastic change in environment. 11. To introduce the betta fish, set the bagged betta in the tank for about an hour. After an hour has passed, release your betta fish to swim freely in the tank. If you’ve been keeping your betta fish in a tiny bowl all this while, it’s time to upgrade. Everyone will tell how easy it is to take care of your betta fish. 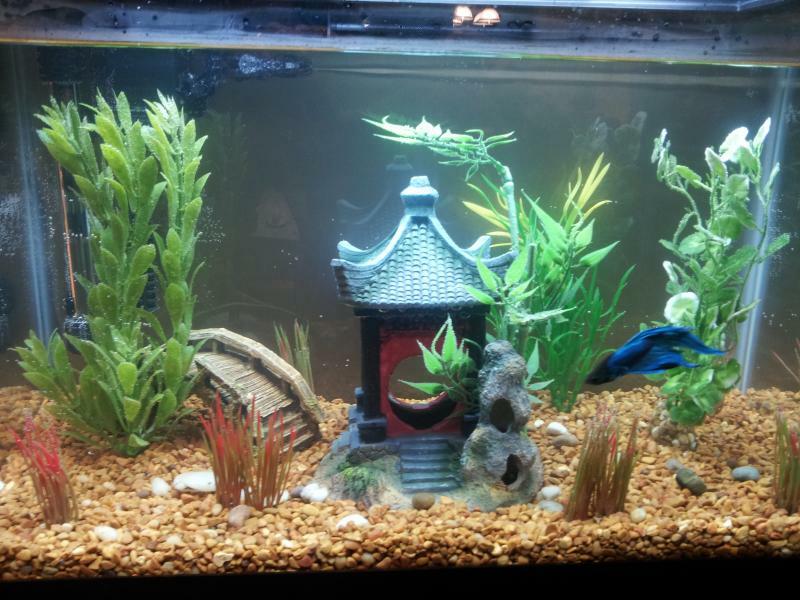 For someone who loves to take care of fish, creating the perfect betta tank can be exciting! 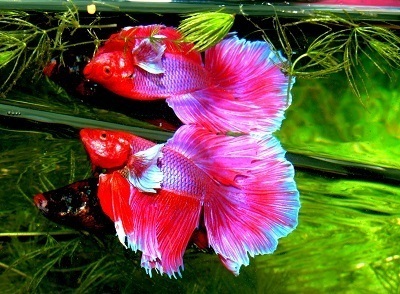 I know one thing for sure, betta fish are best kept alone in separate tanks. And they thrive in varied environments, so adding plants, tunnels, and other decorative items is a treat! Betta fish are extremely active and curious, so keeping the tank clean and challenging is also a must. Having said that, ensure there’s lots of room for your betta fish to swim around. To bring this delightful guide to a close, I want to mention my best betta tank pick. It’s the Tetra 29095 Cube Aquarium Kit. This model has everything you were looking for in a betta tank. It sets the perfect mood for both you and your betta tank, regardless of where you keep it. What Are the Best Goldfish Food Products on the Market in 2019?